NUTRITION FACTS: Serving Size: 1 tblsp (14g); Servings per Container: 16; Amount per Serving: Calories: 20; Total Fat: 0g; Sodium: 10mg (<1%DV); Cholesterol: 0mg; Total Carb: 4g (1%DV); Protein: 0g. Percent daily values (DV) are based on a 2000 calorie diet. 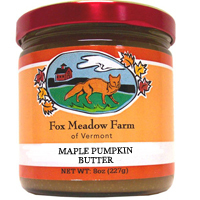 INGREDIENTS: Pumpkin Puree, Water, Natural Cane Sugar, Maple Sugar, Spices, Lemon, Natural Flavor. Maple Syrup is a sweetener that is good for you! It's a good souce of manganese, a mineral that regulates the output of insulin to prevent the blood sugar spikes that lead to energy crashes, excess belly fat and increased risk of type 2 diabetes. Maple Syrup also is a good source of zinc, which stimulates immune cells to shorten the duration of the common cold.